I am delighted to have the privilege to welcome you to this, our sixth annual North American Conference, here in San Francisco today. By some curious coincidence we have elected to meet on the very day, November 6th, when in the United States you are making the most important world leadership decision of the decade. Today, the rest of the world will be watching to see whether the U.S. electorates will endorse, inter alia, the deregulation of oil and gas and the underlying reliance on market forces to produce acceptable energy solutions for national security.Energy security, then, and the role of government is the theme I have chosen today, as I believe it still lies very much at the heart of the current energy debate. Can our energy systems survive and prosper? To what extent are volatile markets or irresponsible governments likely to mess them up? In this I conclude that, while on resource and production cost grounds, the Arabian Gulf still presents a neglected opportunity and Western Europe a neglected risk, the greatest danger lies in the United States' imposing its highly market-oriented energy logic on the rest of the world. Proceedings - Gas Market Deregulation -Twenty Years Later. A Review of Policy Development for Expanding Canada’s Gas Exports to the United States and the Implications for Asia’s Gas Producing Nations. Proceedings - Changing relationships between crude oil and natural gas prices? 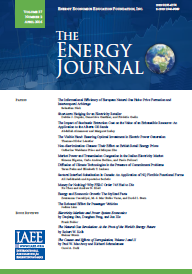 Published in Volume 6, Number 2 of The Quarterly Journal of the IAEE's Energy Economics Education Foundation.